In honor of me turning 30, I’m making mix CDs of my favorite songs from each of my 30 favorite musical artists/groups. Read the introductory post for more background information on my 30 at 30 project. Reminder: there is no scientific rationale for this list. They’re simply my personal favorites. 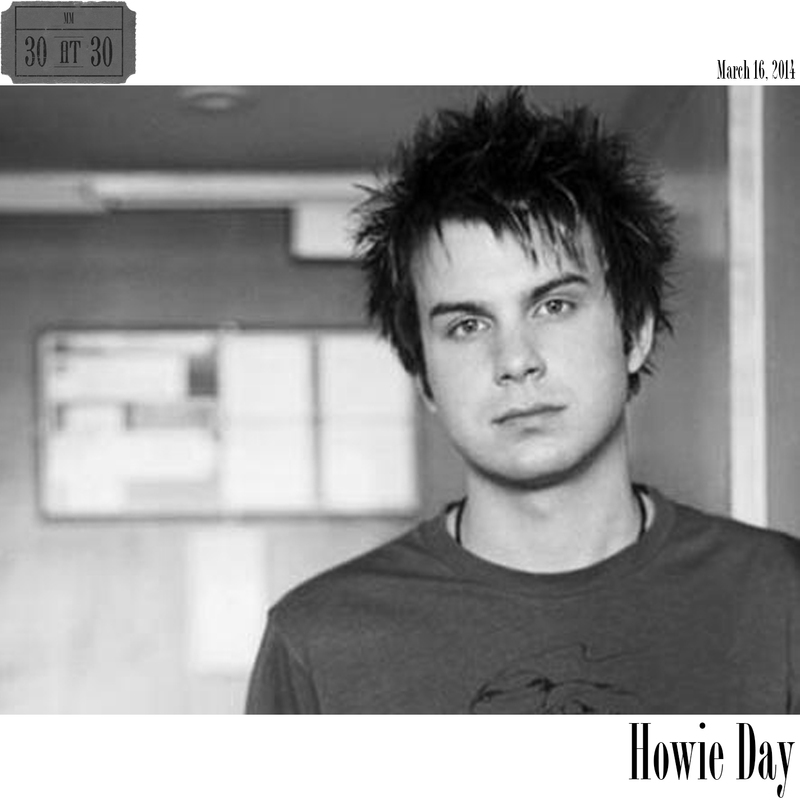 Coming in at number 23 is Howie Day. Howie Day hasn’t released any music since his 2011 Ceasefire EP, and 2009’s Sound the Alarm offers the most recent of his music to make the cut for my compilation. However, his early work, 2002’s Australia and 2004’s Stop All the World Now, was influential enough to earn him this spot on the countdown. Day fits comfortably into the singer/songwriter mold. Aside from the live rendition of “Ghost” there is not a whole lot that stands out musically, but lyrically his songs resonated. If I could make singability a word, the tracks listed at the bottom of would rate very high in terms of being singable. That’s important to me. An aside: A little known fact about me is that I love singing…by myself, especially when I’m driving in my car. People who know me would probably be surprised to hear that because they likely know me as the one who hesitates/resists/refuses to sing or perform in public. Everywhere from church to karaoke, I close up and shy away from the spotlight. I am not a great singer, but I am not a poor one either. I don’t have any formal training, but I’m competent. I just choose not to sing. An additional layer is that I married into a supremely talented musical family. Everyone in Jessie’s family can sing and play, and they do so regularly. They are fantastic. I sometimes wish I could be part of that, but ultimately am overcome with shyness/stage fright when it comes to all things music-related. Getting back to the Howie Day connection, there was a time in my life when I played guitar. I first became interested in 8th grade after hearing some friends play. My dad helped me pick out a red Fender electric guitar. I took lessons for about six months before quitting. I think it was early in college that I got an acoustic guitar. I did not resume taking lessons, opting to occasionally play on my own. I could name the number of songs I could “play” on one hand, but the one that I played better/more often than any others was Howie Day’s “Collide.” I got to the point that I was even able to sing and play at the same time. Still, I never got over my fear of public performance. I never liked playing or singing in front of others, and eventually, the guitar was stashed away to gather dust. I think a part of the reason I like artists like Howie Day is that I his lyrics and vocals are not too far removed from what I imagine would have been my own in an alternate universe where I was an extrovert without any hesitations of putting myself out there on public display. Although I always wrote more poems than songs, few of my words ever saw the light of day. The rendition of “Ghost” that I chose comes from a live show at Boston College on April 2, 2003. I was not in attendance, but the bootleg recording captures the neat looping effect that Day achieved during his live shows. It’s a totally different (and, in my opinion, superior) version compared to the studio version. Additionally, my sister-in-law Abby used to be in a band that performed a version of “Ghost” modeled after Day’s live version. Unfortunately, I don’t have a recording of that gem, but it gave Day a serious run for his money in terms of quality. “Collide” went on to be Day’s biggest radio hit, but I’m not going to allow its commercialization to ruin what is a sweet, romantic song. I particularly like the acoustic version, which is probably my favorite Howie Day song of all. “Perfect Time of Day” is another song that I’ve always connected with in its sense of carpe diem. Perhaps someday I’ll seize the day in a way that allows me to get over my inhibitions permanently. Until that day, I’ve got Howie Day.